So here is the song alluded to before. 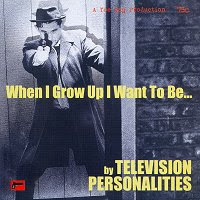 And just MAYBE, I will see Television Personalities on Saturday at Rip It Up. I put this song on my tape, for luck, but it will surely be a first if Dan manages to get his arse over to Sweden. This song is most easily found on Fashion Conscious (The Little Teddy Years) from 2002 - it was originally from a 1999 seven-inch. It's a great song, but first and foremost it was the lyric that caught me. As often in the TVP's case!